The 1980s w as a halcyon period for British cinema, especially British gangster films. Thanks to George Harrison and Denis O’Brien’s Handmade Films, classics like The Long Good Friday, Withnail and I and Mona Lisa displayed a uniquely British sensibility when it came to moviemaking. The irony here is that Mona Lisa was actually directed by Irishman Neil Jordan but British film has always embraced people from elsewhere, with that unique outsiders perspective, like Alexander Mackendrick (Man in the White Suit) and former Monty Python comic turn turned director Terry Gilliam (Brazil, The Fisher King). The 1980s also made a star of unassuming Londoner Bob Hoskins. Mona Lisa is a crime thriller of sorts, in that Hoskins plays George, an ex-con who falls for prostitute with a heart of gold (Simone, played by Cathy Tyson). George is hired by gangster Mortwell (Michael Caine) to act as Simone’s driver but when he imagines a fantasy life for himself and her if he locates a fellow working girl (Cathy, Kate Hardie), it all goes horribly wrong. Jordan creates a magnificently degraded and sleazy London helped by some magnificent performances. Hoskins is the lynchpin here and it is desperately sad to remember that he’s no longer with us. However, Tyson’s Simone is a credible and interesting female character and Caine, although he is not on screen a great deal, does show here that sometimes he is able to be more than just Michael Caine on screen. This is a restored version, taken from the 2K version of the film, and like Withnail and I, the restoration allows us to enjoy Jordan and crew’s masterpiece in its full glory at home at last. The interviews with Jordan, screenwriter David Leland and producer Stephen Woolley do shed a little extra light on the film, and the fact that Jordan brings up Jules Dassin’s Night and the City as an influence on Mona Lisa, another film where London is a character in the film, is a fair comment. 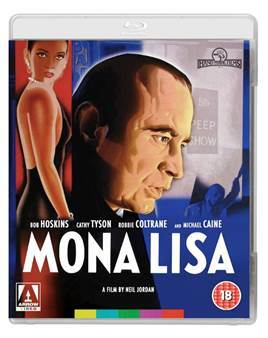 Hoskins was rarely better as was Michael Caine and Mona Lisa, nearly thirty years after it was first released is a modern British movie classic that deserves to be available in this durable quality format.